Today, I am reviewing a whiskey I have wanted to review for a while now – Bernheim Original Kentucky Straight Wheat Whiskey. I have always been curious about this whiskey, but I always suspected that I would not like it since I have never been a big fan of wheated bourbons. However, my experience with Bernheim just goes to show that whiskeys (just like people) can surprise you. This is a unique whiskey from Heaven Hill, a distillery that prides themselves on making many different types of American whiskey well, and selling them to folks at reasonable prices. Just like a Kentucky Straight Bourbon Whiskey, Bernheim is aged for at least three years in charred American White Oak barrels. The difference with Bernheim is that the mash-bill is 51% wheat, with the remainder filled in with corn and barley, whereas bourbon must be at least 51% corn. There is no age statement on the bottle, but my guess is that Bernheim is comprised of whiskey between five and nine years old, averaging about seven years old. The truth is, though, I have no idea how old this whiskey is, and I would love some insight if anybody knows. 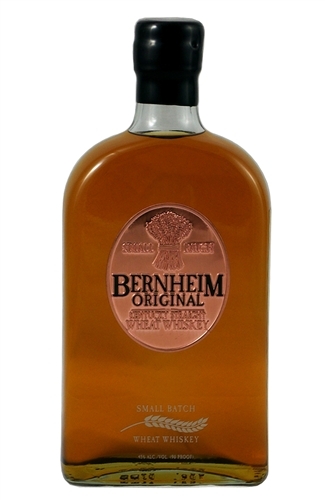 Bernheim Original is bottled at 90 proof (45% abv). On the nose, Bernheim reminds me of a George Dickel whisky more than a bourbon. There are notes of oats, honey, granola, sweet corn, agave nectar, and fresh bread. The nose is very pleasant and airy. The palate continues many of the same notes with a medium-bodied entry. The sweet, bready notes on the palate remind me of the sweet flavors that come from an all-Pilsner malt beer. There is also some corn sweetness, some honey, and some clove notes. The finish is medium in length, definitely longer than I expected it to be. It is a drying finish, with toasted oak, French bread, malt, and caramel all coming into play. Overall, this is a pretty good whiskey that really surprised me. I was expecting to hate it, but there is really a lot more complexity than I thought there would be, especially considering how soft this whiskey is. Bernheim Original is certainly not for everybody, but if you enjoy the flavor profile and mouthfeel of George Dickel, then I highly recommend giving Bernheim Wheat a try. It drinks softer than bourbon, but manages complex and sweet flavors throughout the sip. Heaven Hill continues to impress me with their line of very good whiskeys at great values (see Rittenhouse and Evan Williams). My grade: B. My Price: $30-35/750ml. At the price point, this is a great change of pace from bourbon or rye, and it is always a crowd pleaser. A few weeks ago, I had the opportunity to attend Whisky Live Boston, a massive alcoholic drinks exhibition in downtown Boston. For nearly four hours, vendors, brand ambassadors, and sales representatives discuss their products, while hundreds of patrons sample the aforementioned products. Most of the exhibits are whiskeys of some kind (bourbon, Scotch, Irish, Australian, etc. ), but rum, tequila, vodka, gin, and cocktails of all kinds can also be found at Whisky Live. It is a great event to try new spirits, socialize with other whiskey enthusiasts, and eat some very good food cooked with whiskey (Four Roses supplied the entrées this year). If you ever get the chance to attend Whisky Live (or another similar event), I highly recommend it. However, an evening at Whisky Live requires planning and pacing. If you love whiskey as much as I do, it is too easy to become overwhelmed and go crazy. This usually results in irresponsible drinking, a rough night, and an even worse morning. But, if you pace yourself, drink plenty of water, and make your rounds well, you can have one of the best evenings of your calendar year! 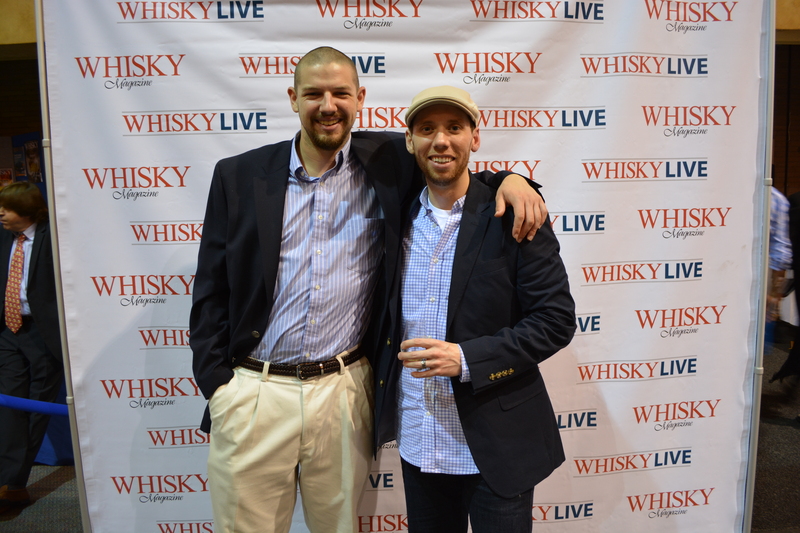 Here are a few of my highlights of Whisky Live Boston 2013. I got to try two bourbons from Heaven Hill that I have wanted to try for some time – Parker’s Heritage Collection Promise of Hope and Elijah Craig 12 yr. Barrel Strength. Previous editions of Parker’s Heritage Collection have been some of the best bourbons released in the last decade, but I was disappointed in this particular edition. That said, it is still a worthy investment, since 25% of the proceeds from every bottle goes to ALS research. The Elijah Craig Barrel Strength is quite a bourbon. It is nearly black in the bottle, but it takes water very well and equals a very good bourbon in the end. I am definitely going to be looking for a bottle to review this fall/winter. I also got to try two very good rye whiskeys that I will be reviewing in the next few weeks: Angel’s Envy Rye and George Dickel Rye. Stay tuned to the blog for more information on these fine ryes. Now, for my whiskeys of the evening… The three whiskeys that really won the evening for me were Glenmorangie Signet, Redbreast 12 year Cask Strength, and Sullivan’s Cove French Oak Port Cask (if you are reading the blog and thinking about present ideas for me this holiday season, take a hint). Glenmorangie Signet is a wonderful single malt Scotch that is made with 20% chocolate malt in the grain bill, and then batched together with older Glenmorangie barrels. It truly is a wonderful sip, with a lot of dark mocha notes, as well as some Sherry influence, and a warming sensation that will warm you up even on the coldest nights. It is not a cheap or easy to find whisky, but if you find it, it might be worth it to bite the proverbial bullet ($225 or so) and grab a bottle, because this is damn good juice. Redbreast 12 year Cask Strength is simply a cask strength offering of the single pot still Redbreast 12 year. At 119.8 proof, this sherry-aged Irish gem leaps out of the glass and across the taste buds with dark fruits, floral notes, sherry, and coffee. This whiskey is the best Irish whiskey I’ve experienced to date (although the Jameson Rarest Vintage Reserve at Whisky Live came close), and it is usually around $70 for a bottle, making it a great choice for the holidays. Those are my thoughts on some whiskeys that impressed me at Whisky Live. What whiskeys have impressed you lately? What whiskeys are you looking forward to trying this fall (whiskey season)? I recently reviewed Glenmorangie Original, a wonderful whisky, and a great value. Although the 10 yr. Original is the most well-known of the Glenmorangie range, Glenmorangie also crafts a series of finished whiskies, which are offered in the standard range as well. As I discussed in my review of Angel’s Envy, the process of finishing a whisky simply means that the spirit’s final aging process occurs in a different type of wood than its primary aging. In the case of Glenmorangie’s range, they produce three standard 12 yr. editions of finished whiskies, all of which are aged 10 years in American Oak casks, and finished in their respective casks. Without further ado, let’s get into the whisky. The three Glenmorangie whiskies I am discussing today are The LaSanta (sherry-finished), The Nectar D’or (Sauternes-finished), and The Quinta Ruban (port-finished). All three whiskies are bottled at 92 proof, and are usually available between $55 and $70 (The Nectar D’or is typically a few dollars more in my experience). All three whiskies start with a lot of the Glenmorangie profile, especially orchard fruits and sweet malted barley. However, each different finishing cask brings its own influence to the spirit. The LaSanta (finished in ex-sherry casks) brings some darker, sweet flavors to the Glenmorangie spirit. There are more nutty notes, and there is definitely a lot of sherry present, especially on the nose. The Nectar D’or (finished in ex-Sauternes casks) brings the wine influence in very well. It brings out the sweetness of the spirit, and also rounds out the whisky with some oak spices. The Quinta Ruban (finished in ex-port casks) incorporates many of the flavors of a young port, with a lot of red grape sweetness, and a drier mouth feel. Overall, my personal opinion in sampling the three whiskies over the span of a few tastings was that The Nectar D’or was the best of the three. It added the most to the Original. I felt that The Quinta Ruban altered the Glenmorangie profile the most, and brought the most difference to the table. I was the least impressed with The LaSanta, but it is still a very quality whisky. All that said, none of the three finished whiskies that I tried made me salivate enough to warrant the $15 price jump over the Glenmorangie Original. The standard 10 yr. bottling is still the best value in the range in my opinion. Just because a whisky is finished, is two years older, and is more expensive does not mean it is the better spirit. Let your taste buds decide. Of course, if you want to get experimental and see what finishing whiskies does to the spirit, I highly recommend picking up a Glenmorangie sampler pack, and giving it your full attention. In the meantime, let it ride! Today, I am reviewing Bully Boy’s White Whiskey (Batch 44). A few weeks ago, I reviewed Bully Boy American Straight Whiskey, and I rather enjoyed it. Today, I am reviewing Bully Boy’s juice right off the still. However, unlike many distilleries, Bully Boy does not use the same mash bill for their white whiskey as they do in their aged product. The American Straight Whiskey is 45% corn, 45% rye, and 10% malted barley, whereas the White Whiskey is 100% wheat. In addition, the American Straight Whiskey is bottle at 84 proof (42% abv), and the White Whiskey is bottled at the standard 80 proof (40% abv). According to Will and Dave from Bully Boy, they chose wheat as their grain of choice for their white whiskey because of the softness of wheat on the palate. As a fresh spirit, wheat has more drinkability than corn and more sweetness than rye or barley. Down at Bully Boy, they have experimented with aging some of their 100% wheat whiskey, but thus far the results have not been as good as their clear spirit or their American Straight Whiskey. So, for the time being, Bully Boy will probably be sticking with their wheat recipe for their white whiskey and their corn/rye/barley recipe for their aged product. It is refreshing to see a micro-distillery trying new things and not bottling those experiments if they don’t come out well. Too many distilleries nowadays are just bottling all the whiskey they can make, and it is insulting to the product, the process, and the consumer. Bully Boy is doing it right. Special thanks to Will and Dave for the bottle! On the nose, this whiskey reminds me of a tequila nose. There is a big, sweet agave note, with some hints of wildflowers, grass, brazil nuts, and walnuts. The palate is very clean. That agave notes keeps hanging around with some nice honey, sour apple, grapefruit, and banana cream. There is also some black licorice, cranberry, and bubble gum. The finish is short (common in white whiskeys), but sweet (agave and bananas). With water, those sour fruits work their way to the fore a little more. Overall, this is a very good white whiskey. Generally, white whiskeys are not my favorite because they tend to be harsh and not very drinkable. However, this one is a fine example of what a little innovation can do. The 100% wheat mash bill is a brilliant idea, and it leads to a nice, sweet, soft whiskey. For a white whiskey, this one is a very enjoyable whiskey straight up, but it is a wonderful mixer. I had some folks over to my place a few weeks ago, and the cocktail ideas were flowing well. The drinkability of this whiskey makes it a brilliant base for any mixed drink. My Grade: C. Price: $30-35/750ml. This is the highest grade I have ever given a white whiskey in my whiskey journal at home, so Bully Boy has a good thing going on here. Don’t be afraid of the white stuff, and let it ride! New England is more known for its craft breweries than its craft distilleries, but all that might be changing. 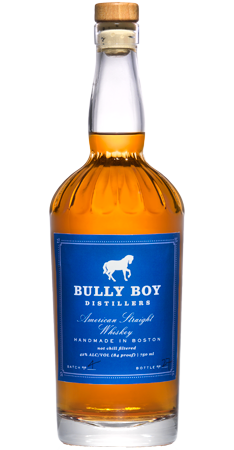 I have already reviewed Berkshire Bourbon, and today I am reviewing Bully Boy’s American Straight Whiskey. Bully Boy Distillers is a micro-distillery in Boston that was founded in 2010 by Will and Dave Willis. 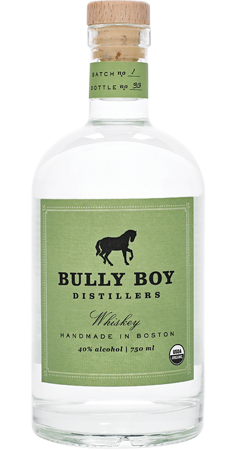 It is the first craft distillery in Boston, and Bully Boy spirits are just starting to become readily available around Boston. They have already won awards at International Spirits Competitions for their White Rum, their White Whiskey, and their Vodka. I’m letting the cat out of the bag a little bit, but I think they are going to win more awards in the future. Today, I am reviewing Batch 4 of Bully Boy’s American Straight Whiskey. This whiskey is neither a bourbon, nor is it a rye; it does not contain at least 51% corn or 51% rye in the mash-bill. The boys at Bully Boy were kind enough to clear that up for me when I sent them a puzzled email. This whiskey is also a true craft presentation. It is done in small batches, and non-chill filtered. There is no age statement on this batch, but I suspect it is fairly young based on its taste and the age of the distillery. It is bottled at 84 proof (42% abv). On the nose, this whiskey demonstrates its rye content up front. There are notes of lemongrass, fresh cut grass, chili powder, white pepper, pine needles, lemon furniture polish (in a good way), a bit of licorice, and fresh ginger. It is really a unique nose for an American whiskey, and it takes your nose all over the place. It is definitely more reminiscent of a rye than a bourbon on the nose. The palate is light-bodied, and it is a bit sweeter, with a lot of spiced nuts and some salt water taffy. There is even a beautiful lemon-lime current that runs through the palate. The finish is medium-length and spicy. There is some good cinnamon, some vanilla, and a resurfacing of the lemon and grassy notes from the nose. Overall, this whiskey drinks like a good, young rye with a twist. This whiskey is very intriguing, and very complex, but it does lack a little depth and body. The flavors are varied, but they don’t evolve as neatly or strike as powerfully as some older whiskeys. I think that means that I cannot wait to see where this whiskey goes with a few more years in the oak, and I definitely commend Bully Boy on their craft presentation of this whiskey. My Grade: B/B+. Price: $30-35/750ml. This one is almost a B+, but it doesn’t quite have the sweetness yet to fully balance out those wild rye notes. This is a great (and fun) everyday pour at a good value. I can’t wait to see where the boys at Bully Boy go with this. Well, I have been debating about whether or not I wanted to review this one for a while now. It is a cold night in Boston, and I poured myself a dram. Honestly, I couldn’t keep my mouth shut. I wanted to rant and rave about this one, so that is what I decided to do. Without further ado, my review of the Ardbeg 10 year-old single malt Scotch whisky. It is non-chill filtered and bottled at 92 proof (46% abv). Ardbeg Distillery has an intriguing history. Distillation first began at Ardbeg on Islay in 1794 (only Bowmore is an older distillery on Islay), although the current site of the distillery began crafting whiskies in 1815. Over the years, Ardbeg became known as one of the peatiest malts in Scotland. However, due to problems with ownership and demand, Ardbeg closed between 1982 and 1989, and it was closed again in 1996. Even still, Ardbeg remained a highly-sought whisky for many connoisseurs. Just when it looked like the distillery would be closed forever, it was bought out in 1997 by Glenmorangie, and Ardbeg was revived. In 2000, Ardbeg introduced the 10 year-old, which I am reviewing today. Many other brilliant whiskies followed, and Ardbeg is now regarded as one of the finest distilleries in the world. On the nose, the 10 yr. takes you right to Islay. There is a salty, peaty backbone to the nose, but there is a lot of depth. There are notes of potpourri, black pepper, citrus fruits (limes), evergreens, gin botanicals, and pears. The palate is medium-bodied, but full-flavored. The backbone is the earthy, wet, salty peat, but there is a ton of depth in this one. There are salty hearty notes, like bacon and prosciutto, followed by sweet notes of cocoa powder, milk chocolate, burnt chocolate, citrus peels, and some floral arrangements. The finish is long and complex, with fresh bell peppers, crackling black pepper, sauteed peppers, leather, tobacco, all backed by that wonderful Islay peat. As the finish lingers, it moves back and forth from sweet chocolate to spicy smoke and wet peat. Overall, this is a brilliant whisky that has layers of depth. 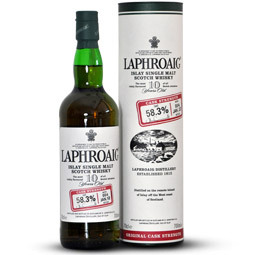 It is an Islay malt that will get you through a fall day, but it won’t bulldoze your palate. There is good reason that this whisky is sought after; it drinks beautifully anytime. It can take water beautifully, but I prefer it neat. My only complaint about this one is that it is expensive given its age. It is only ten years old, yet it is rarely priced under $55-60 here in Boston. On the other side of that coin, it is a brilliant single malt for only $55, regardless of its age. Age is just a number, but in the case of Ardbeg, 10 years age is damn near perfect. My grade: A-. Price: $50-60/750ml. This is my favorite base malt to date, and it is a special occasion after dinner dram worth every penny. If this one is on sale, I usually grab a bottle (or three). To compare tasting notes, check out my friend William’s review here.